A teleconference was held on March 4 with representatives from NASA who went over the various aspects of the Fiscal Year 2015 Budget Proposal. During which, the turmoil in the Crimea, the asteroid retrieval mission, Dennis Tito’s request for an SLS and Orion for his Inspiration Mars effort and the end of SOFIA all were touched on. NASA Administrator Charles Bolden and NASA Chief Financial Officer Elizabeth Robinson were the NASA officials on hand, addressing most questions that were raised. Bolden opened by mentioning the bipartisan support the space agency has enjoyed and that budget proposal allows NASA to keep on the same, “steady” path which will see crewed flights to Mars in the 2030s under the Obama Administration’s directive. Under the NASA FY 2015 Budget Proposal, the space agency is poised to receive some $17.5 billion. NASA’s Space Launch System remains on time and budget (Credits: NASA). Space operations (those conducted primarily in low-Earth-orbit) pulled in about even with NASA’s exploration efforts with $3,905 going to LEO operations and $3,976 going to exploration initiatives. This means that commercial efforts and those to manage the ISS – were given nearly the same amount as NASA’s new heavy-lift booster, the Space Launch System and Orion spacecraft. The Budget Proposal also ensures that efforts to have commercial companies conduct their first launch with astronauts on board will take place by 2017. 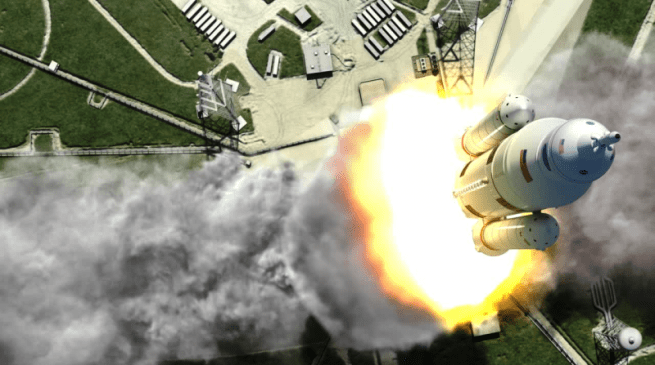 Moreover, the FY 2015 Budget Proposal would allow both SLS and Orion to remain on track. This section of the budget is what will fund the development of advanced space exploration systems, spacesuits, environmental, habitat and related services. These are viewed as key if NASA is to send a crew to an asteroid which has been towed into lunar orbit under President Obama’s direction – by the mid-2020s. One of the “victims’ of the FY 2015 Budget Proposal was NASA’s SOFIA effort which will be mothballed next year (Credits: NASA). Under this section is NASA’s James Webb Space Telescope, currently slated for a 2018 launch on an Ariane 5 booster. Also included is InSight, the Mars Rover 2020 initiative, and OSIRIS-Rex as well as NASA’s newly-proposed mission to Jupiter’s moon, Europa. 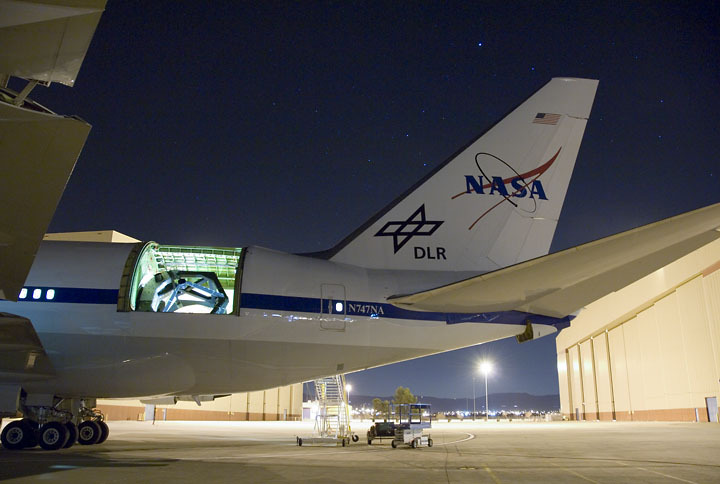 Also within this segment of the budget proposal is an initiative which would mothball NASA’s successful Stratospheric Observatory for Infrared Astronomy or “SOFIA” mission. The rationale behind this is listed as SOFIA’s high operating cost and budget constraints. The 747-based project will come to a close in 2015. While it might not seem that important, this is the arm of NASA which funds the agency’s critical operations to include its facilities and environmental activities – essentially infrastructure-based operations essential to the space agency’s operations. 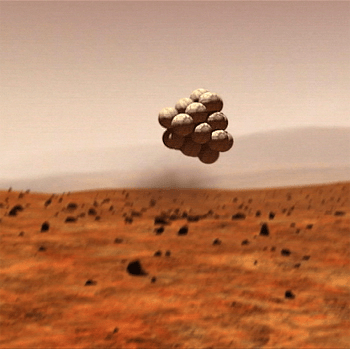 A part of NASA’s budget will go to develop airbags such as the ones which allowed the Mars Exploration Rovers Spirit and Opportunity to land on the Red Planet (Credit: NASA / JPL). This is the branch of the NASA budget tasked with funding the development of solar-electric propulsion systems, that develop the systems which accommodate the power demands of satellites and is also working on the robotic portion of the Asteroid Redirect Mission. Interestingly, part of this section includes “Green Propellant” which is listed as being a: “higher-performing alternative” to the highly-toxic hydrazine. Also mentioned is NASA’s Sunjammer Solar Sail initiative as well as inflatable entry descent and landing technology studies designed to allow heavier payloads to be delivered to the surface of Mars. The first “A” in NASA’s name is under a new strategic vision meant to transform this branch of the space agency in terms of capacity, efficiency and safety. Despite the increase awareness to have students pursue careers in Science, Technology, Engineering and Math, NASA has been allotted less than $90 million for its education efforts. NASA engineer Ernie Wright looks on as the first six flight ready James Webb Space Telescope’s primary mirror segments are prepped to begin final cryogenic testing at NASA’s Marshall Space Flight Center (Credits: NASA/MSFC/David Higginbotham). 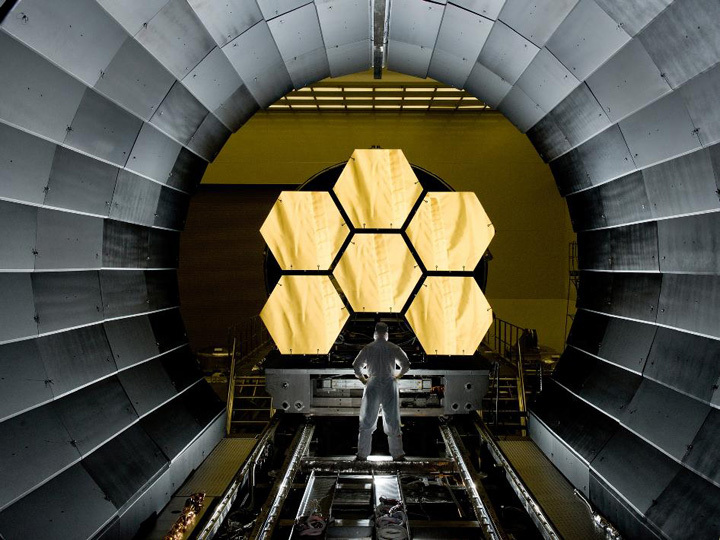 Through this budget, the James Webb Space Telescope, which was at one time on the budgetary chopping block, remains on target for an October 2018 launch. The NASA scientific budget, to include the space agency’s planetary missions has marked the third year in a row that its budget has been cut. For his part, Bolden expressed the view that despite these cuts, the planetary missions are still doing well with the space agency. While the narrative has been forwarded that NASA’s new heavy-lift booster, the Space Launch System or “SLS” will not have a destination once completed, the NASA Administrator stated emphatically and repeatedly that SLS will be used to send astronauts to an asteroid in the 2020s and to Mars in the 2030s. Bolden stressed that, despite declining U.S.-Russian relations due to Russia’s military actions in the Ukraine, there would not be any negative impact on NASA’s access to the International Space Station (ISS). He added that while he was not a historian that the relationship between the U.S. Space Agency and Russia was, as he put it: “intact and normal.” However he noted that NASA continues to monitor the situation. Throughout the course of the more than hour-long teleconference, Bolden and Robinson detailed how they view the necessity of the budget in its current form as well as the impact it will have on NASA’s efforts beyond the orbit of Earth. “Budgets are all about choices and we’ve chosen the path to Mars that involves demonstrating the capabilities of Orion launched on the Space Launch System as the vehicle for transporting our astronauts to cis-lunar orbit and beyond.” Bolden said. Efforts to have Bolden provide a solid answer as to whether-or-not he would approve the request made by Dennis Tito to have his NewSpace organization, Inspiration Mars, provided with an SLS and Orion spacecraft to conduct a crewed flyby or Mars and Venus – went unanswered. Many within the aerospace community and government have expressed a lack of interest in supporting Tito’s efforts. It would mean that the first crewed flight of SLS and Orion would be the flyby mission. With NASA’s rigorous testing regimen – this is highly unlikely to be approved. Attempting to rebut the suggestion NASA’s science missions were being impacted, Bolden highlighted the New Horizons, mission to Mars, the James Webb Space Telescope and the proposed Europa mission (Credits: NASA). Bolden underscored that with the various endeavors NASA is currently working to accomplish as well as the new ones which are being brought online that he was forced to make compromises. “First, we need to keep in mind that we have a $5 billion science budget – but even with that large amount of money we had to make choices. So, our decision was that we would fund a robust Mars exploration program with our international partners, that we would continue to do the types of work in planetary science that we have underway with Juno, with the planned Europa mission, with New Horizons. We currently have the world’s foremost astrophysics mission underway in the Hubble Space Telescope…and we’re now working to launch in 2018 what we think will be the most incredible astrophysics instrument that humanity has ever seen in the James Webb Space Telescope. SOFIA has earned it’s way, it has done very well – but I had to make a choice and the choice was we would focus on those other efforts.” Bolden said. Please proof read your article before posting. 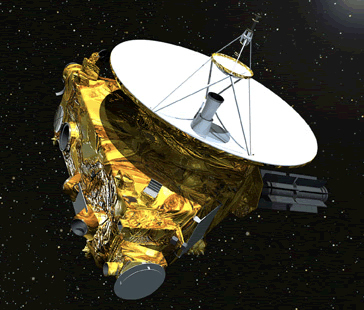 It’s not the “New Horizons mission to Mars”. Also, “Rational” is not the same as “Rationale”. Thanks for the catch Tick Nebula, looks like we omitted a comma with unfortunate consequences! Appreciate the heads up. would you care if I tweet this?